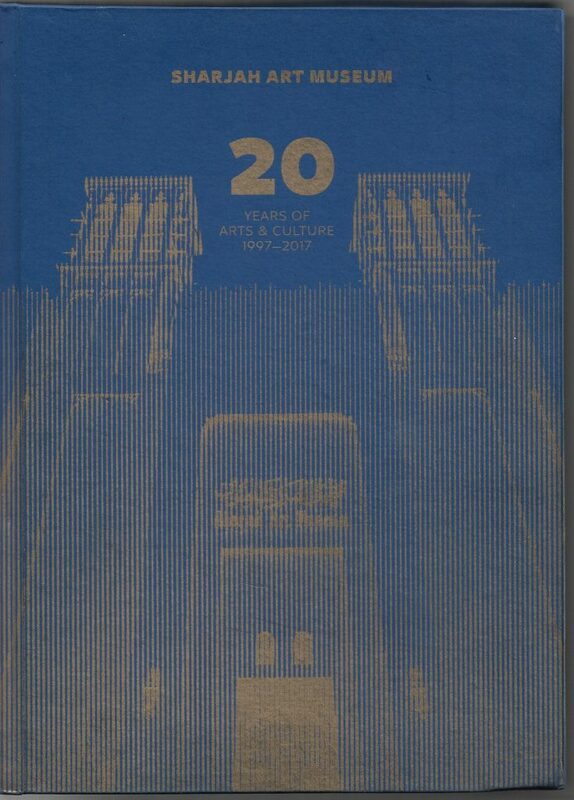 Book celebrating the 20th anniversary (1997-2017) of the Sharjah Art Museum (2018). Here the English front cover of the book, which has on the reverse side an Arabic cover. It is important to have such a facility in any society, where ideas and perspectives can be exchanged in a healthy discourse. Not everyone has to agree on a certain piece of art, or necessary like it for it to work, but anything that makes people think and change perceptions or ask questions, eventually achieves and adheres to our mission. 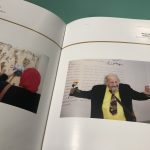 They were printed on page 19 of a book published to celebrate the first 20 years (1997-2017) of the art museum in the Emirate of Sharjah: Sharjah Art Museum, 20 Years of Arts & Culture. I picked up two copies of the book for our library at its launch on the 22nd of March of this year during a visit to Art Dubai, escaping for a moment from the hands of gallerists. Curious also about what I could learn from an institution only ten years senior to the smaller one I have been forging in Amsterdam. Perhaps other words, now from the Sharjah Museum’s director were of use to me: “In the midst of our systematic and continued work, we celebrate the 20th anniversary (…).” Words of steady and anchored progress that may comfort art fair visitors. The hard cover publication does not demand hours of reading and primarily shares with us a timeline of all events and exhibitions at the museum and chronologically arranged pictures of them. The book can be opened from both sides with either a left-to-right reading English text or a right-to-left reading Arabic version. Contributors of the book are clear in what they have to say. They are Manal Ataya, the Director-General of the Sharjah Museums Authority, the publisher, with a foreword, the Chairman of the Department of Culture, Abdullah Al Owais, with ‘Twenty Years of Merit and Integration’ and the museum’s curator Alya Al Mulla with ‘Sharjah Art Museum; A Jewel in the Heart of Sharjah.’ About the museum’s building we are enlightened by Peter Jackson and Brian Johnson, who were both involved in designing and realising the museum in the late 1990s. I should give them this compliment: I visited the museum twice and thought of it as just any institution in Paris, Madrid or London and didn’t attach any specific period or age to it. And thought it had a great facade for the usual banners, not minding these windtowers, I knew nothing about then. In their writings one thing all contributors do the same, dutifully but genuinely, and that is acknowledge the ruler of the emirate, who I browsed online and encountered in an altogether different position of sovereignity: as king of the barbeque. As in that barbeque however, he seems not just to be the ruler, but an active and learned participant. 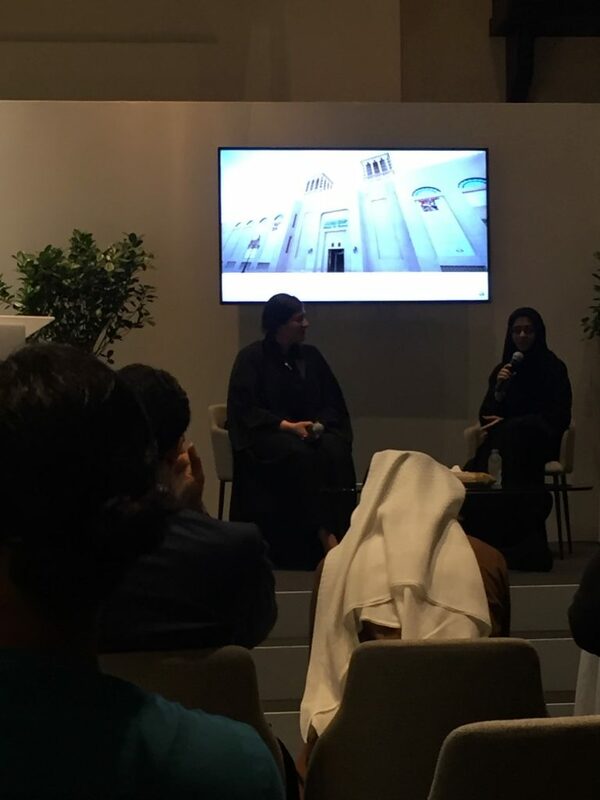 Book presentation of ‘Sharjah Art Museum 20 Years Arts & Culture on 22 March 2018 in Dubai by director Manal Ataya and curator Alya Al Mulla. Apart from those collaborative events there is a permanent flow of local and international exhibitions among them two Dutch ones about the Golden Age of painting (Rembrandt’s time) and the 1950’s free painting movement named after Copenhagen, Brussels and Amsterdam: CoBrA. However, the exhibitions among the many I would have liked to have seen most are a Saudi Cultural Week in 1999, of which no images struggled their way into the book, and an exhibition of printmaking from both India and Pakistan in 2014. Speaking at the launch of the book the museum’s director and curator attached importance to its website and making the permanent collection accessible online. In the book you will find the opening around 2015 of the permanent collection exhibition ‘Modern and Contemporary Arab Art’ not mentioned in the timeline, but pictured on pages 312-314. 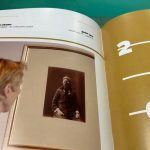 Images of specific artworks in the museum’s collection appear also at the beginning of each of the 20 yearly chapters with photographs of exhibition openings, wich make up the bulk of the book (pages 52-349). It starts from the English side quite appropriately, to balance the famous blind singers and imams, with Man without a Tongue (1999) by Ahmad Nawash. In total around 20 works from the Sharjah Art Museum Collection are illustrated. I tried to find links to the works on the museum’s website, which is part of the website of the Sharjah Museums Authority’s site, but the ‘collection search’ function failed today. I link the page here for future exploration: Sharjah Art Museum Website. As said, the bulk of the publication exists of the many illustrations, nearly all photo’s, of the exhibitions that took place in 20 years and mainly from their openings. When I looked through them I was at first actually annoyed by the many officials featuring in the pictures. I have nothing against my own king’s ambassador to the U.A.E. or the CoBrA museum’s director (no identities are attached to the officials in the photograhs, one needs to guess or ignore them), but I would usually much prefer seeing an artwork in an art museum’s book than officials. It reminded me of the picture reports of weddings in Jeddah, that usually feature the bride’s brothers and her uncles, but not the lady herself. On second inspection I changed my mind. Many of the photo’s are carefully chosen and show the interaction of the offcials and the artworks, sometimes very tale-telling or suggesting and with a good sense of rhyme and humor. Bravo actually for the selection. 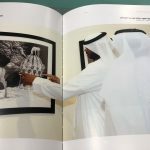 Have a look at the boy on page 221, whenever you get hold of the book, or at a meeting of the emir himself, a Warhol painting and a lady (page 102). I thought the book useful and look forward to the future of the museum’s systematic and continuous work. It left me with the question, which museum around the globe is now or will become in the future the main and inclusive reference institution for ‘Arab art,’ which is something this museum does not collect or research, but relates to nevertheless.